The Toyota Innova gained popularity as Multi utility vehicle in the Indian market. It belongs to breed which are hardly noticed in the auto market. It has replaced Qualis. And it is produced by the World's top manufacturer which operates in India with Kirloskar as Toyota Kirloskar. It perfect multi-purpose vehicle plying on Indian roads. 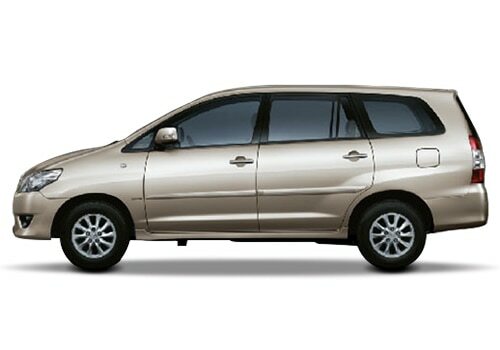 This variant was initially launched in the year 2005 in India and it offered as 8 seater as well as 7 seater MPV. The Toyota Innova Price is Rs. 9.51 lakh to 14.47 lakh (Ex-showroom, New Delhi). The Toyota Innova Features include combination of ruggedness as well as space. The comfort as well as handling offered is similar to the high segment cars. It has inspired, the Indian manufacturers great quality of work in the segment. Earlier most cars sold in the segment were used as taxis. Now, it can be used as owner's pride especially with regards to its design, comfort and safety. Its features are creative. In 2012 Auto Expo, the face-lifted version was displayed. The vehicle is available both petrol as well as diesel. The company now opts to produce BS1V compatible petrol variant. However, the production of BS1V as well as BSIII versions of the variant is still on. The petrol version of the vehicle comes with a 1998cc, 16 valve, DOHC, WTi petrol engine that can produce 132PS max power at 5600rpm and 181Nm torque at 4000rpm while the diesel variant comes with a 2494cc. Hence it get set to drive the next stage of evolution in comfort as well as luxury. The MPV has got touch screen system, bluetooth, steering mounted audio, reverse parking camera as standard fitments on the top of the line. It is available in both steel as well as alloy wheels. Its active safety features is ABS. And its passive safety feature include dual air bags for front passengers. The drive offered by the vehicle makes it the winner than its outright performance. In the year 2012, its exteriors have received upgrade and now it looks, like an premium stylish MPV. Most of the changes are done on the outside of the variant. Its head-lamps are more angular now with protruding turn signal lamps which enhances its dignified appearance, bumpers are re-styled. The fog lamps have become oval as well as beautifully enclosed. It has most plush interiors in the segment and its spacious and its seats are most comfortable. After its recent facelift, it has all brownies as it has now all the frills. The Toyota pictures are available on the photo gallery of Toyota cars.